The traditional term for a male falcon is tercel (British spelling) or tiercel (American spelling), from the Latin tertius (third) because of the belief that only one in three eggs hatched a male bird. 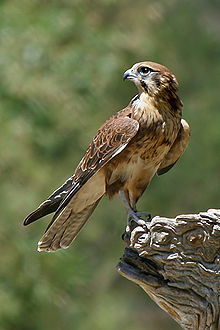 Some sources give the etymology as deriving from the fact that a male falcon is about one-third smaller than a female (Old French: tiercelet). A falcon chick, especially one reared for falconry, still in its downy stage, is known as an eyas (sometimes spelled eyass). The word arose by mistaken division of Old French un niais, from Latin presumed nidiscus (nestling) from nidus (nest). The technique of hunting with trained captive birds of prey is known as falconry. ^ Sale, Richard (28 July 2016). 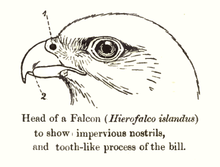 Falcons (Collins New Naturalist Library, Book 132). HarperCollins UK. ISBN 9780007511433. ^ "tercel". Dictionary.reference.com. Retrieved 20 March 2010. ^ "eyas". Thefreedictionary.com. Retrieved 20 March 2010.